The features: 65 kN centrifugal force, 475 kg operating weight, Hatz diesel engine. Our CR 7 reversible soil compactor was completely re-designed. The model designation is the only similarity to the previous model. 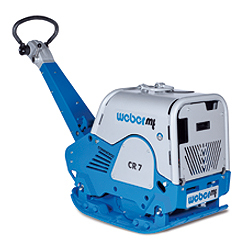 Also available with the compaction control systems COMPATROL®-CCD and COMPATROL®-MSM.